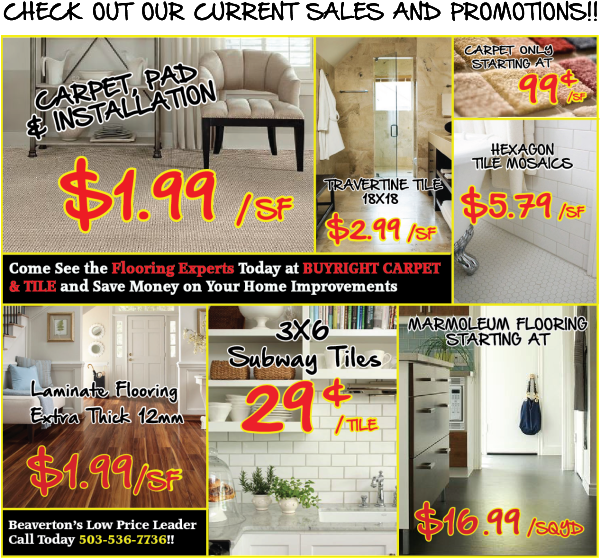 For a Limited Time, Get 3 Rooms of Carpet, Pad and Installation for just $899.00(Some Restrictions Apply). See our carpet sale carpet we are offering 3 rooms of, Daydream I below, with many colors to choose from. Portland Flooring & Carpet of Tigard offers low overhead prices on a huge selection of carpet styles and colors. Tigard Carpet Sale. Carpet Sale 3 Room Special. Limited Time Offer. Free in Home Estimate from Tigard’s Trusted Flooring Source. Call (503) 388-6070. Brand Names. Authorized Shaw Carpets and Mohawk Carpets Sales and Installation. 3 Room Special. Carpet Sale. Browse our Sale Carpets Online Now, then Call (503) 388-6070 or complete our online form to Schedule a Complimentary Estimate.